If you couldn’t find your answer to your weird problem, you might find it here. There is that once in a blue moon chance you will need to install ASpell manually and each time it is easy to forget how to do it properly. Simply put this is more of a Gotcha due to a small mistake that a lot of people make when installing ASpell. 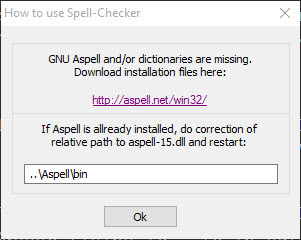 The Gotcha is – you probably did indeed install ASpell, but you forgot to install a dictionary. Tadahhhh – yep that’s it. Just forgot one step. The solution as mentioned in the previous section is to simply install the dictionary with your choice of language. First and foremost make sure your installation of Notepad++ and ASpell are going to be on the same drive. This important because Notepad++ assumes that ASpell is installed relative to its location. If this takes you to your location, then everything should be fine. Restart Notepad++ and you should be able to use the plugin. I think it is safe for me to say that, from an American perspective we usually assume everything is geared towards our American English. Obviously the ASpell program has broken that habit and forced the end user to actually choose instead of assume. Please consider providing me with a monetary tip for the time that I put into making these quality blog posts or software I have written that you may be using. Blog posts can take anywhere from a few minutes, to a couple of hours, to several days to construct. Software is a constant work in progress.